In the nearby Whirlpool galaxy and its companion galaxy, M51b, two supermassive black holes heat up and devour surrounding material. These two monsters should be the most luminous X-ray sources in sight, but a new study using observations from NASA's NuSTAR(Nuclear Spectroscopic Telescope Array) mission shows that a much smaller object is competing with the two behemoths. The most stunning features of the Whirlpool galaxy - officially known as M51a - are the two long, star-filled "arms" curling around the galactic center like ribbons. The much smaller M51b clings like a barnacle to the edge of the Whirlpool. 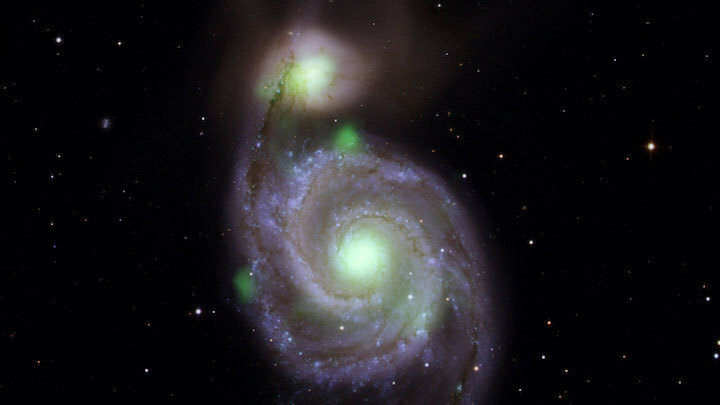 Collectively known as M51, the two galaxies are merging. But neither black hole is radiating as brightly in the X-ray range as scientists would expect during a merger. Based on earlier observations from satellites that detect low-energy X-rays, such as NASA's Chandra X-ray Observatory, scientists believed that layers of gas and dust around the black hole in the larger galaxy were blocking extra emission. But the new study, published in the Astrophysical Journal, used NuSTAR's high-energy X-ray vision to peer below those layers and found that the black hole is still dimmer than expected. "I'm still surprised by this finding," said study lead author Murray Brightman, a researcher at Caltech in Pasadena, California. "Galactic mergers are supposed to generate black hole growth, and the evidence of that would be strong emission of high-energy X-rays. But we're not seeing that here." Brightman thinks the most likely explanation is that black holes "flicker" during galactic mergers rather than radiate with a more or less constant brightness throughout the process. "The flickering hypothesis is a new idea in the field," said Daniel Stern, a research scientist at NASA's Jet Propulsion Laboratory in Pasadena and the project scientist for NuSTAR. "We used to think that the black hole variability occurred on timescales of millions of years, but now we're thinking those timescales could be much shorter. Figuring out how short is an area of active study." Along with the two black holes radiating less than scientists anticipated in M51a and M51b, the former also hosts an object that is millions of times smaller than either black hole yet is shining with equal intensity. The two phenomena are not connected, but they do create a surprising X-ray landscape in M51. The small X-ray source is a neutron star, an incredibly dense nugget of material left over after a massive star explodes at the end of its life. A typical neutron star is hundreds of thousands of times smaller in diameter than the Sun - only as wide as a large city - yet has one to two times the mass. A teaspoon of neutron star material would weigh more than 1 billion tons.